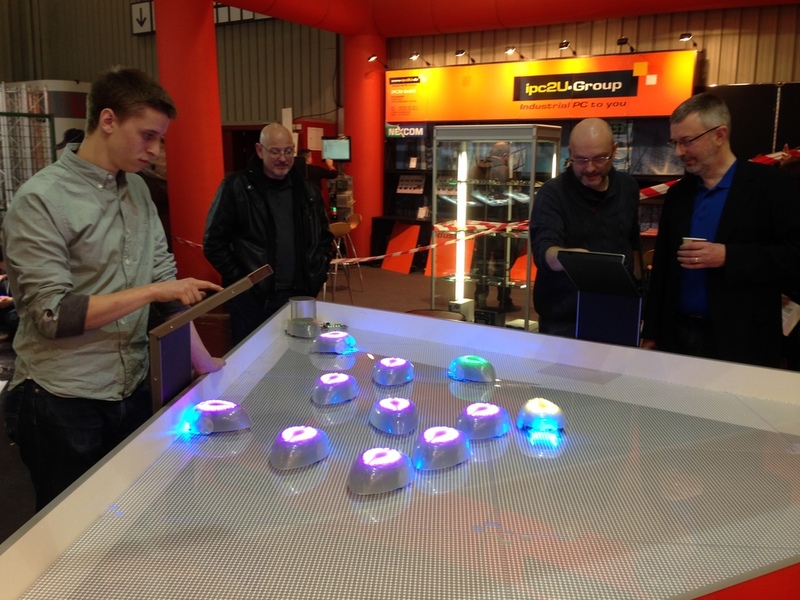 We were thrilled to attend the embedded industry’s largest event of the year, Embedded World, Feb 23-25. Along with Mike Stengle of Knowledge Resources and a select cadre of bots from the diplomatic corps of MoMath’s Robot Swarm, we headed for Nuremburg, Germany and three days of explanation, demonstration, peace talks, and fruitful exchange of ideas. The Swarm’s international expedition was made possible by Xilinx, creators of the SoC (Zynq 7020) that powers each robot’s vision system. The Swarm demonstration featured two iPads running a custom remote control that allowed visitors to drive robots around the space. We passed user commands through our novel collision avoidance scheme (see previous post), preventing drivers from crashing their bots. Somewhat unsurprisingly, this was, by and large, taken as a challenge. Aside from robust collision avoidance, visitors were also awed by the robots’ embedded image processing system for precise global positioning as well as the demo’s expert curators, seen in action below. No, but each is unique in its dimension. In other words, the fiducial indicating x = 114 is repeated numerous times along the line x = 114, but it is distinct from all other x-value (and y-value, of course) fiducials. Wouldn’t using square fiducials, like QR codes, have allowed for greater information density, since they pack better than circles? Yes, but circles are symmetrical, meaning they look the same no matter the robot’s orientation. This simplifies the image processing step and allows a full read from a single line scan. Symmetry also means the value can be read by parsing the first half of a fiducial diameter, reading towards the center, then checked by parsing the second half, reading away from the center. How long do the robots run? Batteries last about four hours. The remote control was designed like a joystick, where each direction moved or rotated the robot relative to its current orientation (holding forward drove forward, while holding hard left rotated counterclockwise). Anecdotally, there was a pretty even split between visitors who intuited this control scheme and those who assumed that, for example, holding left would drive the robot in a fixed, global, ‘left’ direction. So what’s the Real application? Automotive? Industrial? Education is an end in and of itself! Many thanks to Knowledge Resources and Xilinx for this chance to spread the robotic word.